My six year old daughter Penelope is a girly girl. She loves to accessorize her fancy dresses with jewelry. She does not have her ears pierced so I bought her some sticker earrings awhile back but they are constantly falling off and lately she has started to ask for real earrings. EarZings are the perfect accessory for little girls who do not have their ears pierced yet. They look like real earrings but they are pierce free. Instead they have a coil that fits snug around an earlobe all day. You can view the step -by- step instructions on how to wear EarZings here. 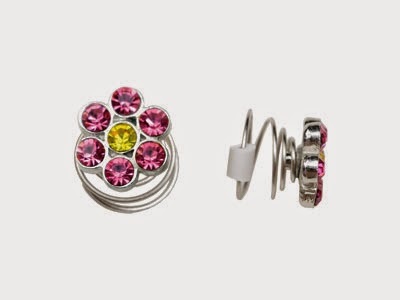 EarZings come in a variety of styles from fancy gems to cute cupcakes. My daughter was so excited when I showed her the collection and told her she could pick out any pair that she wanted. She settled on theseRiley EarZings. 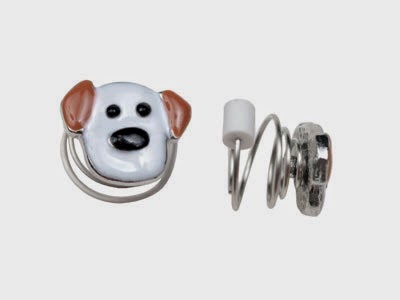 When her little puppy earrings finally came she was eager to get them on her ears. She asked if she could try and do it first but unfortunately she had trouble getting them on herself. I was able to put them on her ears after a couple of failed attempts. Just a warning, if you put these on wrong they do pinch and feel uncomfortable. It may take a couple of tries. Penelope loves her EarZings and is already asking for another pair. You can purchase them online for only $14.95 per pair.